8683 Minifigures Series 1 is a Minifigures set released in 2010. It is, like all sets in the theme, a collection of sixteen exclusive minifigures, many of which are based on concepts never seen before. Each minifigure was sold individually in yellow, blind polybags and came with a selection of accessories, a special display stand, and a paper checklist. 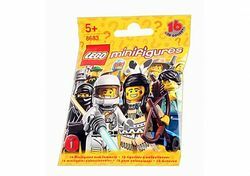 The packaging was intended to make the minifigure a person bought random, however, it was quickly noticed that the barcodes on the back could identify the contents. The barcode was thus removed from Series 3 onwards. LEGO initially underestimated the demand that these minifigures would create, particularly in America. While stocks were often plentiful in European stores, the minifigures were in extremely limited supply in other territories and shops would often sell out their small allotments within a day. Later series' redressed this issue, but Series 1 remains a highly sought-after item because of these problems. This series introduced nine new parts. This series has the lowest number of female minifigures, with merely two. Series 2, 3, and 4 each have three, and Series 5 has four, Series 6, Series 7 and Series 8 each have five. 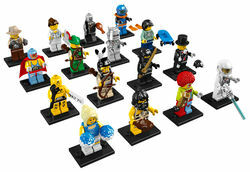 All of the head markings of the sixteen minifigures, with the exception of the Spaceman, are available on LEGO Digital Designer. The Zombie from this series has appeared in the video game LEGO Battles: Ninjago and Monsterland Tales as the Crazy Scientist minions. Each minifigure is counted once in the amount of pieces. This is a description taken from LEGO.com. Please do not modify it. (visit this item's product page) Which mystery minifigure will you get? Discover 1 of 16 individual minifigures in each sealed “mystery” bag! Each minifigure is inspired by movies, sports, history and everyday life. Mystery minifigure might be: Demolition Dummy, Forest man, Cowboy, Super Wrestler, Zombie, Ninja, Cheerleader, Skater, Tribal Hunter, Circus Clown, Magician, Deep Sea Diver, Robot, Nurse, Caveman or Spaceman. Each includes special accessories, display plate and collector’s leaflet. Your mystery minifigure might be: Demolition Dummy, Forest man, Cowboy, Super Wrestler, Zombie, Ninja, Cheerleader, Skater, Tribal Hunter, Circus Clown, Magician, Deep Sea Diver, Robot, Nurse, Caveman or Spaceman. Facts about "8683 Minifigures Series 1"
Which mystery minifigure will you get?